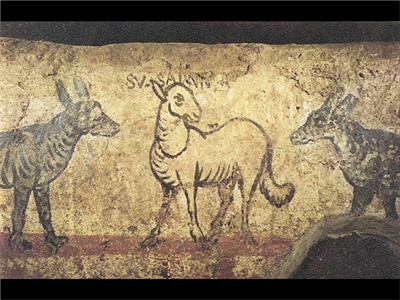 Susanna as a lamb between two wolves, from the Arcosolium of Celerina in the Catacomb of Praetextatus, mid-4th century. 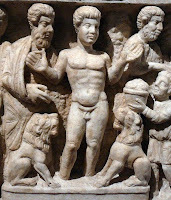 In the catacomb of Priscilla, the story appears in three parts in the burial chamber known as the Greek Chapel, made in the second half of the second century A.D. On the right side, the two elders are pointing at Susanna’s midriff, indicating that “they were inflamed with lust towards her” (verse 8); on the left side, (further from the camera in this photo), the two elders, having been refused by Susanna, accuse her before the people of adultery by placing their hands upon her head (verse 34). She is condemned to death, but the prophet Daniel, inspired by the Lord, saves her by asking the two elders separately where exactly in Joachim’s garden they witnessed the supposed adultery. When they give different responses, the Jews of Babylon realize she is innocent, and put the two elders to death; in the final scene, Daniel (not visible in this photograph) and Susanna give thanks to God for her deliverance. 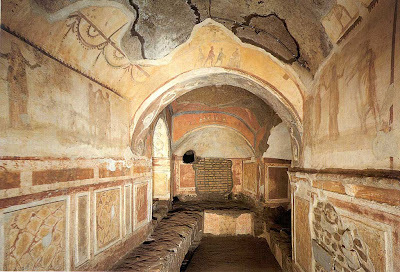 The so-called Greek Chapel in the Catacomb of Priscilla, second half of the second century. The stories of Susanna appear on the side walls, with white backgrounds. In the traditional lectionary of the Roman Rite, the story of Susanna is assigned to the Saturday of the third week of Lent, the longest epistle of the entire year. 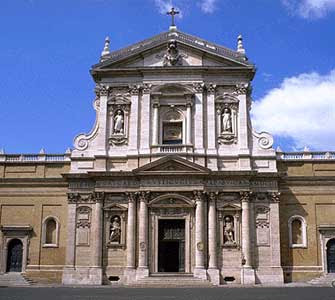 The Station for that day is at the church of Saint Susanna, the niece of Pope St. Caius (283-296), traditionally said to be martyred, like her uncle and her father, St. Gabinus, under the Emperor Diocletian. This station was clearly chosen for the coincidence of names; in the Ordinary Form, it has been moved into the week traditionally known as Passion Week, although the stations have not been rearranged accordingly. In the lectionary of 1969, it may also be read in an abbreviated form which begins directly with Susanna’s condemnation at verse 41. The facade of Santa Susanna by Carlo Maderno, 1603. In the Ambrosian Liturgy, which in many respects provided inspiration for the post-conciliar revisions, the association with the Lord’s Passion is made even more explicit. The reading is assigned to Holy Thursday, which in the Milanese lectionary is focused much more on the Passion than on the institution of the Eucharist. At the service of readings and prayers to be said after Terce, the first reading is that of Susanna; the psalmellus (the equivalent of a gradual in the Roman Rite) which follows is taken from Psalm 34, “Unjust witnesses rising up have asked me things I knew not. They repaid me evil for good.” The second reading is from the book of Wisdom, chapter 2, 12 – 25, beginning with the words “In those days the wicked said to each other: Let us lie in wait for the just, because he is useless to us, and he is contrary to our doings, and upbraideth us with transgressions of the law, and divulgeth against us the sins of our way of life.” The Gospel that follows immediately after, Matthew 26, 14 – 16, tells of the betrayal of Judas, who sells the Lord for thirty silver pieces. Although the reading was chosen to prepare the catechumens for membership in a persecuted sect, it continued in use after the liberty of the Church, as did many other early liturgical references to the Age of the Martyrs. In the Breviary of St. Pius V, we read an explanation of this in the second nocturn of Passion Sunday, from the ninth Lenten sermon of Pope St. Leo the Great, whose feast is kept today in the traditional rite. (In Lent) a greater fast was ordered by the holy Apostles, taught by the Holy Spirit, so that by a common sharing in the Cross of Christ, we too may in some measure partake in what He did for our sake, as the Apostle says, 'If we suffer with Him, we will be also glorified with Him.' Certain and sure is the hope of blessedness promised to us, when we partake of the Lord’s Passion. There is no one, dearly beloved, who is denied a share of this glory because of the time he lives in, as if the tranquility of peace was without occasion for virtue. For the Apostle foretells us, 'All that will live godly in Christ Jesus, shall suffer persecution'; and therefore, there will never lack the tribulation of persecution, if the observance of godliness is not lacking. For the Lord himself says in his exhortations, 'He that taketh not his cross, and followeth after me, is not worthy of me.' And we must not doubt that these words apply not only to his immediate disciples, but belong to all the faithful and to the whole Church; who all heard of His salvation in the person of those present.